Photo: modified from an original by TIME Inc. There are some terms that people in Islamic and Western countries should never say to each other, because they confuse and inflame more than they clarify. The most obvious ones would be “jihad”, “crusade” and “great satan”. All of them are used in somewhat innocuous ways by the people who utter them, but mean something completely different – and much more inflammatory – to foreign ears. I would like to propose a topical addition to the list of words that should never be used, and that would be “myth”. Specifically when it is used in the context in which Iranian President Mahmoud Ahmadinejad and Egyptian Brotherhood leader Mohammed Mehdi Akef have mentioned it in recent months, i.e. to speak of "the myth of the Holocaust" (Egyptian Islamists deny Holocaust; BBC News, 23 Dec 2005) . They know what they mean by the phrase, and I know what they mean, but if they think that most people over here are going to hear it and respond with anything more profound than “Holocaust deniers!” then they are deeply ignorant of how central is the Holocaust in U.S. perceptions of the Middle East, how superficial is the U.S. public discourse on relations with the Muslim world, and how much that discourse is framed by those who are pushing for a “clash of civilizations” and who are currently fixated on finding a justification to bring about regime change in Iran. Everyone knows what a myth is, right? It’s just a fairytale; an unlikely, invented story featuring toga-clad heroes of the ancient past. So when Ahmadinejad and Akef talk of the “myth of the Holocaust” they are simply – as the BBC suggests in the report I linked to above – saying that the Holocaust never really happened, and can be written off as Holocaust deniers. Except that that’s not what a “myth” is. (And I must be getting old, because I actually remember the days when any reporter employed by the BBC would have known the meaning of the word, and made some effort to render it accurately). Let me tell you what a “myth” really is. Humans are complex beings who live in complex societies, and are capable of thoughts, insights and feelings beyond the mere physical needs of everyday life. Some of the intangible things that we feel about ourselves are difficult to articulate, so we express them by telling stories. And that’s what myths are. Myths are stories that groups of people tell to express and justify their most fundamental beliefs about themselves, their origins, their essential nature and their aspirations. The stories themselves can be historical or non-historical, but that is irrelevant to the myth. In the U.S., which for all its religiosity is basically a secular and demythologized society, we tend to think of myths as fairytales because the most common exposure we have to them is via the craptacular Hollywood spectacles of the 1960's like Jason and the Argonauts. But in fact a myth is a myth because it is a story that tells an underlying, existential truth about the people who tell it, and historicity is nothing to do with what makes it a myth. For example, there are tribes in New Guinea that tell a traditional story about how children are conceived. The story explains that human conception takes place only when an emu passes through the parents’ village by night, and casts its shadow over their hut - all of which was very amusing to the 19th century European anthropologists who first documented the story, and thought it meant that the dumb natives didn’t even know where babies come from. But of course the dumb natives knew perfectly well where babies come from: the story was actually about something else altogether. In the religious mythology of those New Guinea tribes, the emu was a symbol of divinity, and the story about the emu’s shadow was a creation myth that explained the origins of human beings and expressed what kind of creatures we are. By saying that a human baby can be conceived only when the parents are touched by the presence of the emu (God), the story expresses the conviction that humans are not just physical beings. Although a part of the created order, human beings have “higher” qualities that set them apart from every other created thing; they have the ability to transcend their instincts and passions and to be self-aware, spiritual, creative, empathetic etc, etc. So the conception of a new human being is never just a physical act, but requires an act of divine creation. It needs the mother and father to do their bit, but it doesn’t happen unless the emu makes an appearance too, as the myth puts it. If the people of New Guinea were Jewish, they might express the same fundamental understanding about themselves by telling a story about God breathing the breath of life into a handful of dirt to create the first man, or they might sum it up simply by saying that humanity is made “in the image and likeness of God”. Another kind of myth: here in the U.S. we have made a myth out of the story of the Mayflower. Very few of us could claim that our families literally arrived here on the Mayflower. A few of us descend from people who were already here when the Pilgrims arrived. Quite a few of us came here on slave ships; an awful lot of us immigrated on steamships in the early 20th century; and some of us came here more recently courtesy of Boeing. But as Americans, we share a common narrative that says we, collectively, came here on the Mayflower. And we do that because we see in the story of the Mayflower a representation in historical form of what we as a nation believe America to be. We take the historical event and make it into a story that describes what we as Americans believe we essentially are: a pioneering people, a city on a hill, a community of faith in search of religious liberty, a free people fleeing tyranny and establishing democracy, etc etc. That’s a different kind of myth from the emu story: one is a nationalistic myth, based on an historical event; the other is a religious myth, based on a non-historical event (i.e. there isn’t a real flesh and blood emu involved in human conception). But they’re both myths, because they are stories used to tell an underlying, existential truth about the people who tell them, and calling them myths is not in any way a judgement on whether the events in the story are historically true. They don't say the Holocaust didn't happen; they are suggesting something more complex than that. That last quote in particular suggests that Ahmadinejad is using the word “myth” in its correct, technical sense. Remember: myths are stories that groups of people tell to express and justify their most fundamental beliefs about themselves, their origins, their essential nature, etc. Ahmadinejad is saying that Zionism tells the story of the Holocaust in exactly this way, i.e. as a vehicle to explain and justify what Zionists believe about themselves. When he “denies” the “myth” of the Holocaust, he is not denying the Holocaust, he’s not even discussing the Holocaust as a historical event at all. He is denying the validity of the use to which the story of the Holocaust is being put. He is saying that instead of being a story that expresses an underlying truth, “the myth of the Holocaust” expresses a “truth” that simply isn’t true, and that denial of that myth is such a big deal in the West because you are not meant to question whether the underlying claim is really true. So what exactly is the “myth of the Holocaust” that Akef and Ahmadinejad reject? Well, do you remember Wissam Tayem, the Palestinian man forced by Israeli soldiers to play his violin for them at a checkpoint in the Occupied Territories? The reaction to Wissam Tayem's experience at that checkpoint succinctly summarized what Ahmadinejad means by "the myth of the Holocaust". As Chris McGreal pointed out at the time, the sight of a Palestinian being forced to play the violin for his occupiers caused quite a stir in Israel. But the main reason it made Israelis (specifically Jewish-Israelis) uncomfortable was not because they recognized that it's simply wrong to treat a human being the way Wissam Tayem was treated. Instead, it made them uncomfortable because it challenged their image of the kind of people they are, and the kind of country they have created. In other words, it undermined the Israelis' myth of themselves. [A]fter the incident was videotaped by Jewish women peace activists, it prompted revulsion among Israelis not normally perturbed about the treatment of Arabs. The rightwing Army Radio commentator Uri Orbach found the incident disturbingly reminiscent of Jewish musicians forced to provide background music to mass murder. "What about Majdanek?" he asked, referring to the Nazi extermination camp. The critics were not drawing a parallel between an Israeli roadblock and a Nazi camp. 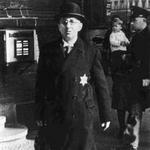 Their concern was that Jewish suffering had been diminished by the humiliation of Mr Tayem. 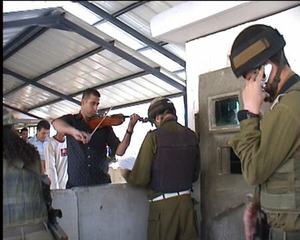 Israel shocked by image of soldiers forcing violinist to play at roadblock; The Guardian, 29 Nov 2004. That last line sums up precisely what Ahmadinejad and Akef mean when they say that Zionism has made a “myth of the Holocaust”. They mean that Zionism tells the story of the Holocaust with the purpose of justifying what it has done to Palestine and its inhabitants. The underlying truth that the myth is meant to convey is that Jewish suffering in Europe justified the establishment of a Jewish state in a land whose population was 1. not Jewish, but overwhelmingly Muslim and Christian and 2. not responsible for European anti-Semitism or the Holocaust. 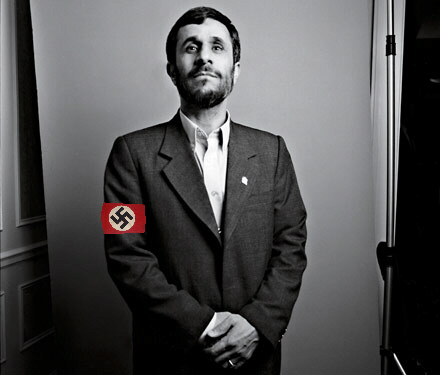 Ahmadinejad and Akef are saying that this myth is a fake; that it is not an explanation of an underlying truth, but an appropriation of the Holocaust in order to further a political agenda. When they deny the “myth of the Holocaust”, they are not talking about whether the historical events of the Holocaust really happened, they are denying that Zionism is entitled to do what it does to the Palestinians because of what Nazism and its collaborators did to European Jewry. In short, "the myth of the Holocaust" says that Shoah justifies Nakba, and Ahmadinejad and Akef are saying, “No, it doesn’t”. Stressing that "the same European countries have imposed the illegally-established Zionist regime on the oppressed nation of Palestine", he said, "If you have committed the crimes so give a piece of your land somewhere in Europe or America and Canada or Alaska to them to set up their own state there. Then the Iranian nation will have no objections, will stage no rallies on the Qods Day and will support your decision." In a message on Thursday, Akif said: "Western democracy has attacked everyone who does not share the vision of the sons of Zion as far as the myth of the Holocaust is concerned. "… But on Saturday, his office said: "Some media gave this a meaning which he [Akif] did not intend [and read it as] a denial that the Holocaust of the Jews by the Nazis during World War Two happened. The fact is that he did not deny that it took place." As to the reported statement describing the holocaust as a myth, it was not intended as a denial of the event but only a rejection of exaggerations put forward by Jews. This does not mean that we are not against the holocaust. Anyway, that event should not have led to the loss of the rights of the Palestinian people, the occupation of their land and the violation and assault of their sacred places and sanctities. So, who really cares what a myth is, and what bearded foreigners half a world away have to say about it? Normally, this might just be an interesting academic discussion, but right now it actually matters that we try to understand what Ahmadinejad is really saying, because the Iranian government is currently the target of a disinformation campaign designed to soften up public opinion for regime change in that country. When we hear an inflammatory claim being pushed by our corporate media about Iran and its president - like for example, “Ahmadinejad denies the Holocaust!! !” – we would do well to remember the sad performance of our news media in laying the foundation for war in 2003, and to ask ourselves whether each new revelation is real news, or manufactured “news” designed to mobilize public opinion for a new war. The same people who brought us the spectacular failure that is the Iraq war, would now like to try their luck in Iran. Paul Wolfowitz explained in May 2003 that, in the absence of a clear and present danger from Saddam Hussein, the Bush Administration had looked around for a justification for invading Iraq and settled on WMDs as the rationale that everyone could agree on. This time around, the U.S. needs a new excuse for invading a country that clearly is not going to invade us, and it’s really not too hard to see that the new excuse is going to focus in large part on the person of Mahmoud Ahmadinejad. Just look at the thrust of the stories about him that our news media have been feeding us over the last six months. 1. He’s a Holocaust denier! That’s what we are meant to understand from the reporting of his “myth of the Holocaust” statements that I have just been discussing. 2. He wants to wipe Israel off the map! That’s what we were told in our news media’s hysterical reporting of Ahmadinejad's speech to the “World Without Zionism” conference in Tehran on 26 October 2005. Except it turns out that, when correctly translated, he didn’t really say that Israel must be wiped off the map, but that "the occupation regime over Jerusalem should vanish from the page of time", which is not a threat of war or annihilation, but an expression of hope for regime change. Ahmadinejad isn’t a Zionist. He doesn’t believe that the Muslim-majority land of Palestine should be forcibly transformed into a Jewish state, and his speech is an expression of confidence that Zionist rule over Jerusalem will come to an end just as surely as other once-powerful regimes (he cites the examples of the Shah in Iran, the Communists in the Soviet Union, and Saddam’s rule over Iraq) all came to an end. If you look at the Middle East through a Zionist perspective, you might not like to hear that, but it doesn’t give anyone the right to pretend that he’s threatening to launch nukes at Tel Aviv or drive the Jews into the sea, as the “wiped off the map” language would suggest. 3. He's a "psychopath" who "speaks like Hitler"! Except there is no such Iranian law. This story was a complete hoax (later retracted by the National Post), perpetrated by an Iranian monarchist expatriate journalist named Amir Taheri, who coincidentally happens to be a member of Benador Associates, a public relations firm that lists a large number of leading neo-conservatives, including American Enterprise Institute (AEI) associates Richard Perle, David Frum, Michael Ledeen, Michael Rubin, and Joshua Muravchik, among its clients. Major boosters of the war with Iraq, Benador clients, who also include former Central Intelligence Agency chief James Woolsey and former Israeli minister Natan Sharansky, have also called for the Bush administration to take a hard line against Iran. The newspapers that so far have run the story are similarly identified with a hard line against Tehran. The National Post, which was bought by CanWest Global Communications from Conrad Black, a close associate of Perle's, is controlled by David and Leonard Asper, who have accused the Canadian Broadcasting Corporation of being anti-Israel, according to Marsha Cohen of Florida International University, who has closely followed the badges story. Are you sensing a theme here? Are you getting the message that Mahmoud Ahmadinejad is the new Hitler and Iran is the Fourth Reich and they’re just days away from nuking us and if we don’t Shock and Awe them into regime change and install a U.S.-friendly regime that will recognise Israel and sell their oil and gas to us instead of to the Chinese then we’re all a bunch of appeasing Neville J’aime-Berlin’s and WE'RE ALL GOING TO DIE!!!…? Because that’s what you’re meant to understand. That’s the new meme, to make you scared enough to support a war you wouldn't otherwise support. Once again, our fears are being manipulated by people who want a war but haven't got a justification for starting one. Last time, they brought public opinion on board with scary stories about Iraq’s nonexistent nuclear weapons and Saddam's fictitious links to al Qaeda; this time around, it's Iran's nonexistent nuclear weapons and Ahmadinejad's spurious equivalence to Hitler. And that’s why unravelling the meaning of Ahmadinejad’s "myth of the Holocaust" is not just an obscure academic exercise. Knowing that a propaganda offensive is underway to demonize Iran's president as the new Hitler so that we can justify an attack on his country, we need to think critically every time our mass media draws these parallels between Nazi Germany and present-day Iran and consider whether this is a legitimate equivalence or more manipulative scare-mongering to lay the foundation for a new war. Despite what Richard Perle and Michael Ledeen et al sound like when they dispassionately discuss rearranging the Middle East, war is not really like a game of Risk or a role-playing exercise in an undergraduate PolSci seminar. It is much more like young soldiers getting their limbs blown off by roadside bombs, or entire families wiped out "collaterally" by our missiles. Knowing that this is what is really at stake, we should at least make the effort to determine whether the “Holocaust denier!” and other hitlerish epithets currently being hurled at Iran are based in fact, or are just the latest work of the same misinformers who – from the safety of their Washington thinktanks - repeatedly pimp for war in the Middle East, safe in the knowledge that it will never be their friends and relatives on the receiving end of the IEDs or the so-called smart bombs. After more than three years in Iraq, when more than 2500 of our own troops and unknown thousands of Iraqis have been killed, Americans have finally become skeptical about why we invaded Iraq in the first place, and are wondering what exactly we are fighting for there. When it comes to the threatened attack on Iran, maybe this time we could do the critical thinking before we invade and sentence to death tens of thousands of our fellow human beings whose lives are as valuable in every respect as our own. In the immortal words of the President himself: "There's an old saying in Tennessee -- I know it's in Texas, probably in Tennessee -- that says, fool me once, shame on -- shame on you. Fool me -- you can't get fooled again." Ahmadinejad: Lost in translation; Little Red Email, via Information Clearing House, 5 April 2006. Does Iran's President Want Israel Wiped Off The Map - Does He Deny The Holocaust? ; Information Clearing House, 14 April 2006. Iran; The Early Days of a Better Nation, 1 May 2006. Latest Hitler: How Lies Becomes News; Lenin's Tomb, 20 May 2006. Another Fraud on Iran: No Legislation on Dress of Religious Minorities; Informed Comment, 20 May 2006. 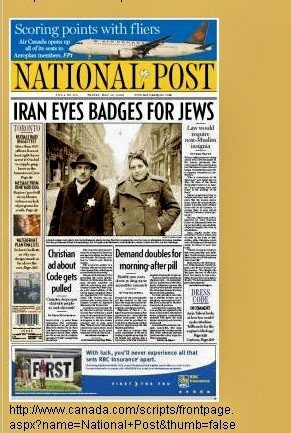 Yellow stars for Iranian Jews? The disinfo campaign; Just World News, 20 May 2006. Harper says Iran 'capable' of introducing Nazi-like clothing labels; The Canadian Press, 21 May 2006. Taheri-ng It Up; Unqualified Offerings, 22 May 2006. Iran Target of Apparent Disinformation Ploy; Jim Lobe, 22 May 2006. Fake But Accurate; Antiwar.com, 24 May 2006. Too Stupid for Citizenship: Will Americans fall for Bush's lies again? ; Antiwar.com, 1 June 2006.